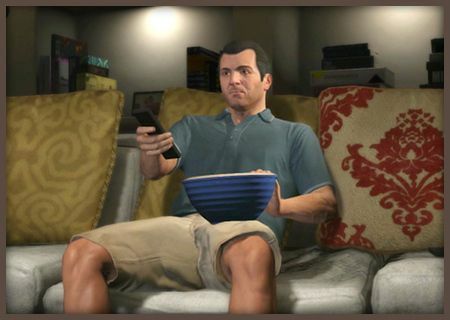 I have to admit that up until GTA V, I never liked Grand Theft Auto series. I guess I just didn’t see the appeal of playing awful people doing awful things, and the dissonance between the destructive sandbox and strictly scripted story missions annoyed me to no end. I still played the series out of professional curiosity, hoping for something closer to my beloved Red Dead Redemption, only to end up being disappointed again and again. And then something happened when I was checking out GTA V. Between all the car chases, shootouts, and wisecracking one-liners, I’ve decided to take a break and call my (in-game) wife. I knew she wouldn’t pick up, that I’d just end up hearing her voicemail message, but I did it anyway. Why? Former GTAs did that thing, where you had to keep interacting with your girlfriend and friends to gain some bonuses. So maybe I did it for gameplay benefits? An achievement at the least? Nope. It had no extrinsic reward attached. When you think about it, that’s true for most actions in GTA V.
It’s pretty shocking to see a AAA sandbox do away with all the reward loops the genre is known for. No collecting, no building, no crafting, no taking control over the map. According to modern game design knowledge, it should be a recipe for disaster. In reality — it’s liberating! I remember getting so absorbed by the collectible icons on the mini-map in Far Cry 3, that I missed the fact I ventured into a giant ship scrapyard. All the level design work went to waste, because I was too focused on finding totem #76 to get my 500xp reward. 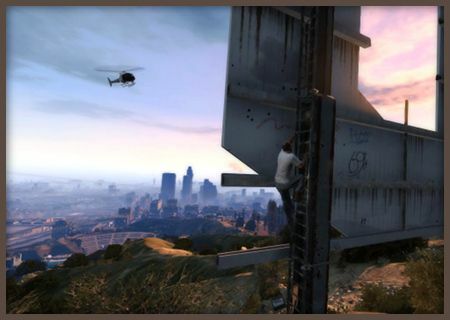 No such thing happens in GTA V. You can go on a walk across the beach, take a bike ride to the countryside, or admire graffiti without worrying about hidden money stashes, dead drops, or whatever else the designers came up with. If you do something, it’s because you yourself want to. Not because there’s some carrot attached to the end of the stick. Same thing applies to interactions with NPCs. You can call your buddy and hit the town together, but it won’t unlock a better weapon nor increase their loyalty variable. You simply get to hang around and listen to what they have to say about the latest events. Or you may just get wasted and go to the movies. It makes the game’s world feel like — well — a world, instead of a glorified chessboard where every action is a veiled strategic decision. And it’s a huge world, too. I don’t think it’s possible to see everything in GTA V. Even if you are very dedicated. You could see it as a wasted effort. After all, would it hurt the game if there were two less radio stations to listen to? Would the sales drop if the in-game internet and facebook spoof had half as much content and depth? Probably not. But in this case the trick doesn’t lie in balancing the amount of content so that players can see the most of it. It’s in making sure they won’t. If the game can create virtual reality that’s just too big to explore and deconstruct, every choice suddenly becomes more meaningful. After a while, you begin to notice the underlying structure. You just have to run around Normandy after every major mission to see all crew dialogue the game has to offer and unlock every loyalty mission or romance. It’s still enjoyable, but hardly like living in another world — it’s back to being just a game. With a clear set of rules. I approached GTA V with the same mindset of trying to see everything, but it’s simply impossible. Even the LifeInvader (in-game Facebook parody) itself is too big to handle. Three protagonists, each with their own set of friends posting hundreds of messages all the time. You’d go crazy trying to get through it all. I gave up quickly. However, when Michael’s family leaves him (umm, spoiler alert? ), I’ve found myself checking their LifeInvader accounts to see what’s going on with them. Let me reiterate: I stalked my wife and kids on Facebook. In a video game. If you simply can’t do everything, then what you actually choose to do becomes meaningful. We used the same trick in Cinders by having so many choice points that the player had to stop trying to figure out their structure and give in to role-playing. GTA V uses its crazy budget to crank that up to eleven in every aspect of the game, obscuring the underlying mechanics with sheer amount of content. Complete freedom has its charm, but not when you’re trying to tell a story. If you had asked me about my Skyrim character, I couldn’t tell you much. He was a saint solving problems of everyone who asked for help, but — umm — he also kind of lead the guild of evil assassins. He also enjoyed killing stuff in caves… And crafting armor. Oh, and that one time, he put a bucket on a shopkeeper’s head, because he saw that on YouTube. Good times. That’s a common problem with sandbox games. Players see right through them and treat them as theme parks — taking every ride possible, and quickly forgetting about their initial goal. GTA V solves that problem by using various tricks to make it all seem like a directed experience, despite the player still being able to do anything they want. One brilliant inclusion are the short scenes that play when you switch to another character. Let’s say you zoom to Michael and find him trying to watch TV, while his wife argues with his daughter again. Finally, he can’t take it anymore and leaves. This little scene gives context to anything you decide to do afterwards. If you go and rob a liquor store, it’s not another ride at the theme park anymore. It’s a frustrated, aging thief unable to cope with normal life, committing a petty crime to feel that thrill again. In short — it’s a story. Having three playable characters is another brilliant move. If you’re in a mood for some rampage, you can switch to Trevor who’s likely to be already in trouble. If you want to try the stripper mini-game (which is wrong on so many levels…), you can do it with Franklin and reinforce the point that the life of crime has made him lonely. You can do any crazy gamey thing and still have Michael behave like someone who’s genuinely trying to fix his life. Unlike my Skyrim character, you are allowed to stay in role and still get to enjoy the sandbox. I thought that at this point in the storyline, when things take all the wrong turns, Michael would like to hear her voice. Even if it was just a voicemail greeting. I thought that would be an important point in his character development if I were in charge of the story. And the funny thing is: at that moment, I was! 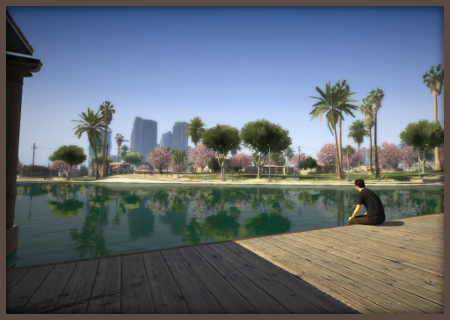 GTA V is still a troubled game. It constantly struggles to find its identity, unsure whether it should be The Sopranos or South Park. The overarching storyline seems fractured and makes little sense, and it’s all just… unpleasant or downright offensive. However, it managed to make me feel like a part of an actual virtual world, and gave me tools to tell my own story within the framework provided by the designers. All without “breaking” the game. I can’t help but call it a milestone in video game storytelling. Sure, it’s still an adolescent power fantasy, but it makes me excited for what other developers may do in the future. Thanks to Auriea of Tale of Tales for inspiring me to write this article. And if you want to say hello or see what we’re up to these days — check my twitter.